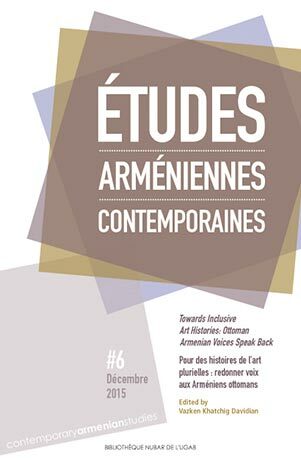 In March 2016, the AGBU Nubarian Library released the sixth issue of its Études arméniennes contemporaines, a bilingual, biannual and multidisciplinary journal published in Paris. The articles in the latest issue – subtitled “Towards Inclusive Art Histories: Ottoman Armenian Voices Speak Back” – focus on Armenian arts in the Ottoman Empire. According to a press release by the AGBU Press Office, the latest issue goes beyond art history to reflect on the way Ottoman history has been treated by historians. The articles advocate challenging conventional understandings of history and critique dominant nationalist discourses. They also introduce into the historical debate silenced voices that have been deliberately excluded from history. In so doing, this volume aims to contribute to the discussion on creating inclusive, nuanced and just representations of complex pasts. All articles are available for free on the journal’s website: https://eac.revues.org/. As part of the revues.org database, Études arméniennes contemporaines is part of web-based versions of more than 400 humanities and social science journals in French and other languages. This editorial evolution enables the journal to contribute more substantively to the field of Armenian studies. Contributors to this issue include Helin Anahit, Eray Çaylı, Vazken Khatchig Davidian, Aikaterini Gegisian, David Low, Gizem Tongo and Alyson Wharton-Durgaryan.